When grandmother’s cooking is just way too good, what can you do? Instead of keeping all that talent for friends and family, you share it. Eugenia’s kare-kare is the star of their family reunions and celebrations. She is often called as “Lula” by her granddaughter Jennifer because the little girl couldn’t pronounce “Lola” which means grandmother in Filipino. Thus is the story of Lula’s House of Kare-Kare. Eugenia Padilla’s well-loved kare-kare can now be enjoyed by you and me. Kare-kare is beef stew with oxtail, tripe, vegetables and savory peanut sauce. Lula’s House of Kare-Kare spends almost a whole day to prepare this Filipino favorite. The beef is just so tender. Should you visit this restaurant, you have to order their kare-kare. For me, the perfect partner of kare-kare is crispy pork knuckles more popularly called as crispy pata. They slow cook this up to 12 hours to make sure the meat is tender. But the skin, it’s just so crunchy. Another crunchy pork treat is the bagnet. Lula’s House of Kare-Kare describes this as cispy fried pork belly, a cross between chicharon and lechon kawali. Also try the tender and tangy beef stewed in tomatoes, their beef mechado. Beef lengua in white sauce is slowly cooked ox tongue in mushroom sauce and cream. Beef lengua in red sauce is melt-in-your mouth tender ox tongue stewed in fresh red tomatoes. You want it sizzling? They serve sizzling sisig, sizzling sinigang and sizzling bulalo. The sizzling sisig is spicy, it’s perfect with plain rice. 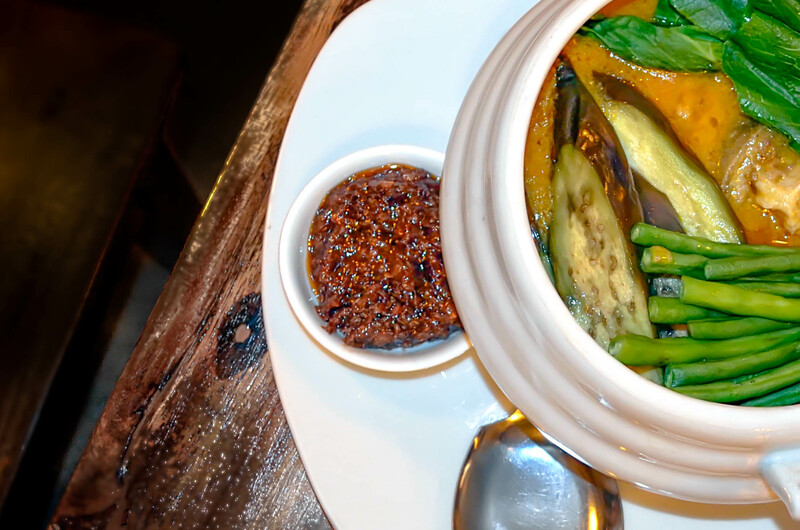 The sizzling sinigang is their delicious twist to the traditional sinigang. Sinigang is tangy pork stew in tamarind broth with vegetables. Their sizzling sinigang is deliciously buttery and tangy. The sizzling bulalo is also a savory dish oozing with umami goodness. Tender beef and rich bone marrow with vegetables bathed in creamy, beefy gravy. For snacks, try their lasagna.